Europe's public authorities are major consumers. 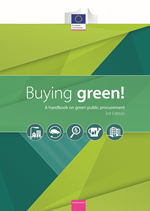 By using their purchasing power to choose environmentally friendly goods, services and works, they can make an important contribution to sustainable consumption and production - what we call Green Public Procurement (GPP) or green purchasing. Although GPP is a voluntary instrument, it has a key role to play in the EU's efforts to become a more resource-efficient economy. It can help stimulate a critical mass of demand for more sustainable goods and services which otherwise would be difficult to get onto the market. GPP is therefore a strong stimulus for eco-innovation. To be effective, GPP requires the inclusion of clear and verifiable environmental criteria for products and services in the public procurement process. The European Commission and a number of European countries have developed guidance in this area, in the form of national GPP criteria. The challenge of furthering take- up by more public sector bodies so that GPP becomes common practice still remains. As does the challenge of ensuring that green purchasing requirements are somewhat compatible between Member States - thus helping create a level playing field that will accelerate and help drive the single market for environmentally sound goods and services. A webinar to discuss the latest changes in the European Commission's newly revised Green Public Procurement (GPP) criteria for road transport will take place on 12 April (10.30-12.00 Brussels time (CET)). As well as introducing the new criteria, the webinar will also present case studies, and will provide an opportunity for questions and discussion. For more information and to register, please visit the registration page. The EU GPP criteria for indoor cleaning services, published in October 2018, are now available in 23 languages. criteria on tyres and lubricants for maintenance activities. The new criteria are available in English; the other EU official languages will soon follow. The new criteria are available in English; the other EU official languages will follow soon. A webinar to discuss the latest changes in the newly revised EU GPP criteria for cleaning services will take place on Tuesday 18 December 2018 14.00 - 15.30 CET (Brussels time). Speakers will provide insights about the revision process and their experiences implementing environmental criteria in the purchase of indoor cleaning services. Prior registration is essential. To do so, please visit the registration page. the supply of consumable goods with reduced environmental impact. The new criteria are available in English; the other official languages will follow soon. The EU GPP criteria for paints, varnishes and road marking, published in January 2018, are now available in 23 languages. The European Commission brochure on Public Procurement for a Circular Economy, published in October 2017, is now available also in French, German, Italian, Polish and Spanish. Visit the publications page to download the brochure. The Commission has just published new voluntary EU GPP criteria for paints, varnishes and road markings. They cover both the purchase of products and of works in this area. The use of the draft criteria has the potential to considerably reduce environmental impacts from these products and their costs. Some of the most likely impacts of the application of the GPP criteria are expected to foster circular economy aspects and are the following: minimise the impact of production by addressing specific ingredients and dosage; reduce the hazardous properties of the overall formulation; promote durable paints and road markings; incentivise minimisation of product wastage, including reuse and recycling. A new brochure on Public Procurement for a Circular Economy has been published by the European Commission. The brochure provides introductory guidance and good practice on the points where public procurement can be used to support the transition to a circular economy. As well as considering the policy framework and strategies such as strategic thinking and engaging the market, the brochure provides guidance on identifying where and how to make a purchase more circular according to the principles of reduce, reuse, recycle and recover. Alongside each of these sections, good practice examples are also provided, demonstrating how circular economy principles are already being implemented across Europe. The brochure builds on the direction set in the EU Action Plan for the Circular Economy by providing a range of practical steps for using green public procurement (GPP) to drive forward the transition to a circular economy. The Commission has just published new voluntary EU GPP criteria for furniture, an area with a high annual spend by public authorities. A major change from the existing GPP criteria for furniture (published in 2008) is the introduction, in addition to classic furniture purchasing, of sections on the procurement of furniture refurbishment and of end-of-life services. Those new areas aim at prolonging the life span of furniture items, thus reflecting a reinforcement of circular economy aspects in EU GPP criteria. • Reduction of the quantities of furniture waste sent to landfill as products become easier to separate. A webinar to discuss the latest changes in the newly revised EU GPP criteria for textiles took place last Wednesday 28 June 2017. Three speakers provided their insights about the revision process and their experiences implementing environmental criteria in the purchase of textile products and services. · EU Green Public Procurement (GPP) Support Tools – Robert Kaukewitsch, European Commission, Directorate General for Environment. · What's new in the EU GPP criteria for textiles - Nicholas Dodd, European Commission, Joint Research Centre. · Practical experiences from the European Clothing Action Plan (ECAP) - Barbara van Offenbeek, Ministry for Infrastructure and Environment (the Netherlands). The presentations and a recording of the webinar are available here. The Commission has just published new voluntary EU GPP criteria for textiles products and services, an area with a high annual spend by public authorities in the area of military, police and fire fighter uniforms as well as for hospital staff. A major change from the existing GPP criteria for textiles (dating back to 2012) is the introduction of textile services, an emerging market with a high potential to reduce environmental impacts. • Contract services which maximise the potential for re-use and recycling of textiles at the end of their service life. The EU GPP criteria for Computers and Monitors, published in October 2016, are now available in 23 languages. The EU GPP criteria for Road Design, Construction and Maintenance, published in June 2016, are now available in 23 languages. Subscribe to our monthlyNews Alert here. A Helpdesk service is available to disseminate information about GPP and to provide answers to stakeholders' enquiries. You can find more information here.